May 25, 2010 - 8 weeks and our first appointment. 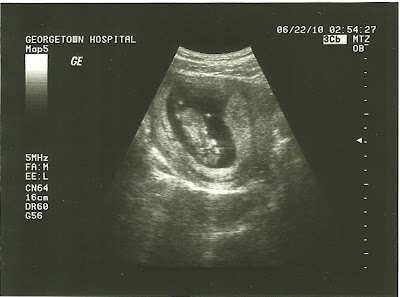 Our little one was literally just a bean. As you can see the doctor even circles the heartbeat so we wouldn't miss it later. 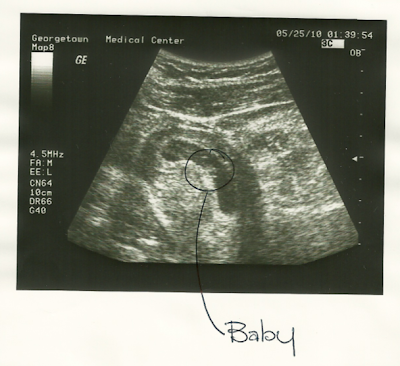 The dark spot is my uterus and the circled light grey area is the baby. 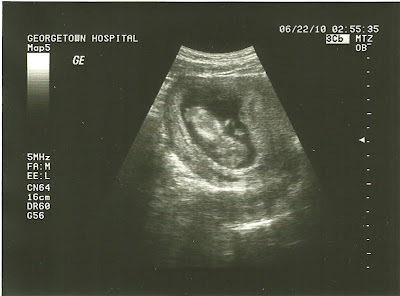 During the sonogram all you could really see was the flicker of the heartbeat. Here we have two pictures to show how active the baby was, kicking and punching the entire appointment. The baby was too small to feel, but I am sure those jabs will be coming any day now. See how the arms and legs are tucked in and up. Now the baby is fully stretched out. While we were watching, the baby kept running, kicking, and punching. It actually made it hard to get a good image as the baby would blur across the screen! Our doctor said it was one of the most active babies she had ever seen this early. We are not surprised! Now we joke that our little one is doing lax sprints in my belly.